Yeah yeah yeah, on your birthday you sit down and take measure of what you've learned, where you are, where you're going. Or, if you're procrastinating, it's when you sit down and actually write out all of the above. 1) I am 34. I know this, but hopefully you didn't, at least not when you looked at me. Right?... RIGHT? 2) Age ain't nothing but a number. 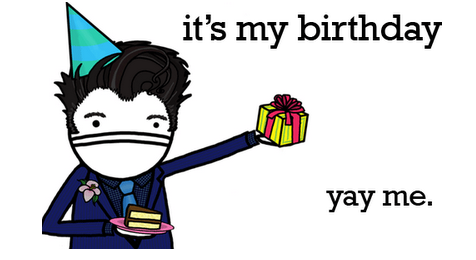 It might seem self-serving as I edge further into my 30s, but it's conveniently true. I have observed this from a line of people, namely the 100 year old man who just ran a marathon. And my grandma, who, bless her, in her 90s still lives (mostly) alone and gets even more beautiful with age. And my mom, who is in her 60s and just published an incredible novel to much acclaim, just because she's always wanted to. I'm even more inspired by the previous two because we have that whole "genetics" thing going. My mom is still a social butterfly and a beauty and is excited every morning and happy about life; that's an attitude that has nothing to do with when you were born. You can be 16 going on 95 or you can be 95 going on 21. Or you can be 34 and still slightly tempted to lie about it, but that's another story for another day. 3) All you need in life is a few good friends. These good friends will put one candle, not 34, on your birthday cake. Especially if they know what's good for them. You can't choose your family, and hopefully you'll get lucky with them, but if you do, hate to break it to you but... it's not to your credit. As life throws you more curveballs, you tend to notice who your good friends are, who steps up to bat when it's most important to you- and perhaps not so convenient to them. Having even one of these is a blessing. I have quite a few of them. When I see a new baby, I always wish them good friends (in my head, because saying it aloud is a bit psycho, I'm sure you'll agree). You can't choose so many other factors in your life, and you certainly can't predict what events will come, but you can choose who you are in the trenches with. 4) Trust your gut. The first day of law school, I went to a payphone and cried to my mom that I had made the wrong decision. Now, anyone who knows me raises an eyebrow because I am *not* a crier. And secondly, they raise an eyebrow because they can't believe that in the year 1999, I did not have a cell phone. That was the first in a long line of times I have overridden my gut or done something because I was "supposed" to do it (or not do it). And guess what? It always backfires, sometimes in disastrous and very public ways (see: my perm, circa 1991). As in decisions, as in judgments about people, you have your instincts for a reason. I finally have learned to use them more, question them less, and save myself a lot of internal debates. 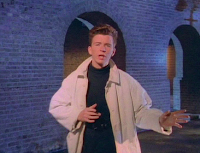 I prefer to save my mental space for important things, like contemplating why no one stopped Rick Astley from wearing that trench coat-turtleneck combo in his video. 5) Complain while you're on the treadmill. A girl in high school told me she had given a friend who was complaining about weight this advice: "Complain to me while you're on the treadmill." I hate to side with logic on this one, but I agree. Rather than sit around and complain about what you don't like in your life, complain while you're trying to change it. It takes more work, but it's a tad bit more effective. It takes distinguishing what you can change and what you can't, but this isn't a philosophy lesson. 6) If you're feeling grateful, pay it forward. Every time I feel grateful for something- my health, people in my life, etc., I try to do something to pay it forward. Sitting around and appreciating things is nice, but doing something with your gratitude is more fulfilling. Everyone close to me (and, in an inappropriately-timed revelation, a recent date...) knows about my obsession with adoption and that my biggest concern is children lacking loving people to help raise them. It seems cruel and unfair, especially when I got hit with a double-dose of serious parenting. So this year for my birthday I asked that my friends (and anyone who is so inspired) to consider donating anything they can to the Mama Kevina Boarding School in Uganda, care of Real Medicine Foundation, whose work inspires me daily. I always roll my eyes when people say it feels good to do something good. So cheezy. And yet, so true. Feel free to roll your eyes, but if you could do so after you press the Donate button, even better! 7) The more you focus on something, the more you allow it to take over your life. See also: The Kardashian phenomenon. 8) A good cup of coffee fixes everything. I swear by this, as do my friends (at least, the ones I TRUST!) There is nothing I love more than a big cup of coffee with someone I care about, whether it's reheated coffee in my parents' kitchen or a latte with my girlfriends. Coffee has the power to heal, just maybe not heal the shakes I have when I'm done drinking it. 9) It's mind over matter. I don't know if I believe this, but I'm going to have to when I run the Rock n Roll Las Vegas half marathon, in the middle of the desert and at night in a month. This is also relevant when we consider the fame of certain pop stars and other celebrities. 10) Happiness is a choice. Writing makes me happy, so my decision to write this instead of doing my work right now was completely calculated. In related news, I am overcaffeinated. Today is full of good decisions. Here's hoping the next 34 years are as well.